It’s been a couple months since the launch of our new website, and we couldn’t be happier or prouder about our new makeover! 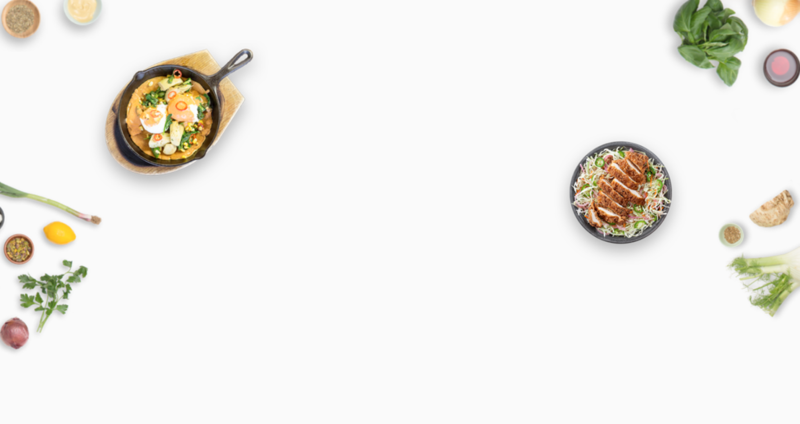 We’ve made ordering catering online a lot easier, smoother… and, well, prettier. Seems like this is everyone’s favorite new function! 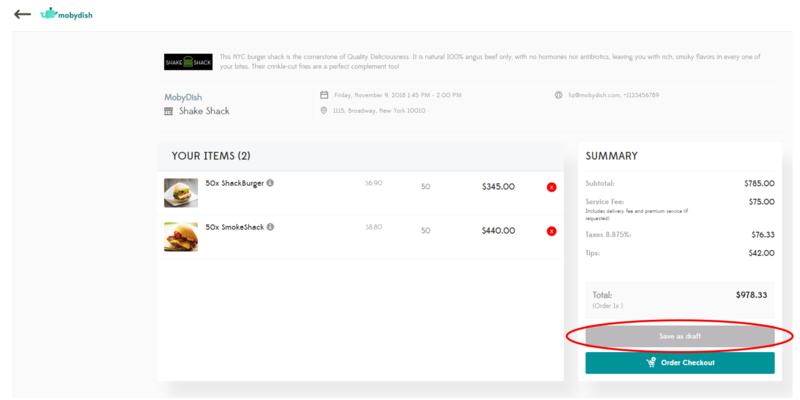 You can now build your order without placing it right away. 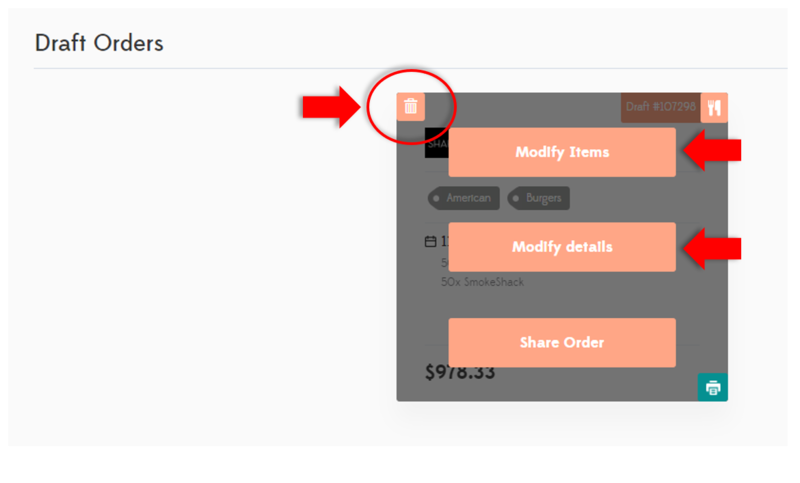 Add items to your cart, check-out, enter all your event and company details, and look for the “Save as draft” button on the final check-out page, under your order Summary. To access all Draft Orders, go to “Ahoy” in the top-right of your screen, then “Manage My Orders.” Draft orders are not saved by browser, they can be viewed from any computer or device. Drafts come in handy when you want to save your items and but want to wait before placing the actual order (waiting on approvals, feedback from teammates etc.) This way you don’t lose your order, and once you’re ready, you can simply click back into the draft order and place in seconds! Don’t forget, you can still modify items or details in draft orders… even delete the draft order if you want to forget about it (look for the trash icon in the top left corner)! Another really cool added benefit to this feature is that, if you work with a MobyDish account manager, he or she can build all your orders as drafts in your account and then prompt you to review/modify/approve all these drafted orders so there’s less back-and-forth! 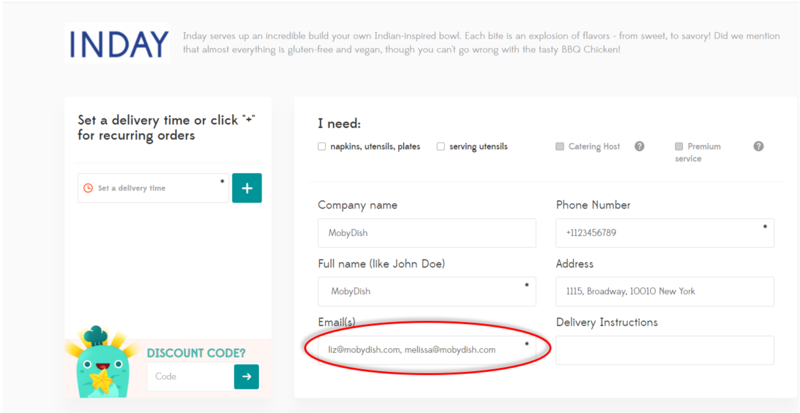 Spread the love and show your coworkers, friends, family, pets all the tasty meals you’re getting with MobyDish. For all draft and future orders, you can hover over the order and click “Share.” This will prompt a new window showcasing a beautiful illustrative version of the order, complete with dish images and descriptions. Copy and share the link (which can be pasted into anyone’s browser), or print this page to hand out! 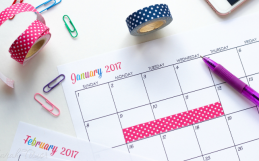 Ask feedback from your colleagues and managers to streamline communication all around. 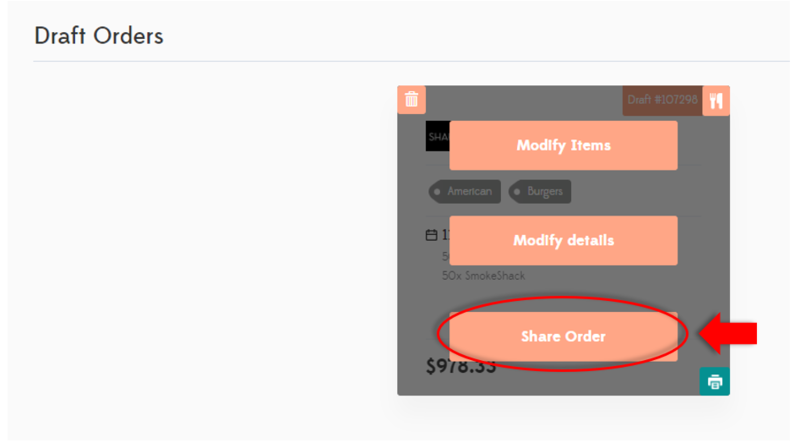 Hover over any draft or future order for the option to Share the order! Did the restaurant forget to include catering labels with the order? We hate when that happens, since the labels highlight important dietary and allergy information! Luckily, we made it easy to access your labels for every order. Hover over the order and look for the fork-and-knife icon in the top right corner. When clicked, the labels will download automatically to your comp! If there are multiple people overseeing the catering program at your office, this one’s for you! No more forwarding or saving down order confirmations when sent to one email address. Now you can enter multiple email addresses, separated by commas, so everyone on the distribution will receive order confirmations and updates when the order is on its way! We’ve pinned to every restaurant when it was last ordered under your account. 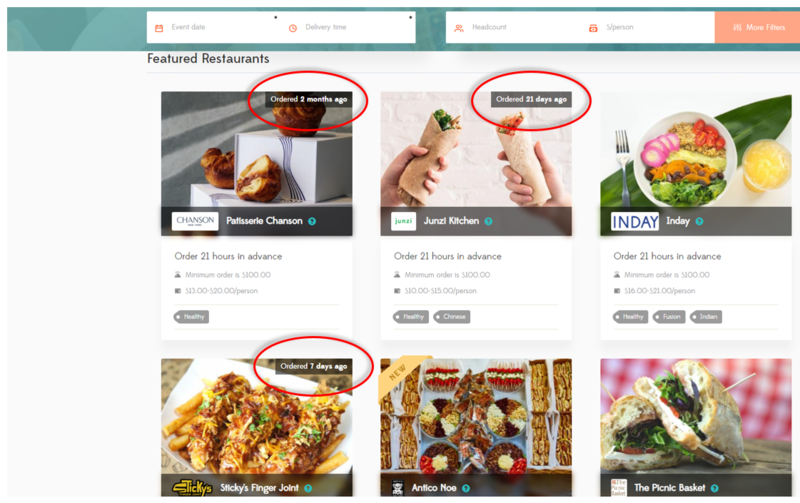 So when you’re browsing through the restaurant catalog page, look for the tag at the top corner of every restaurant box to know when it was last ordered! Hopefully this makes it easier when making your meal decisions, if you want to avoid close repeats. 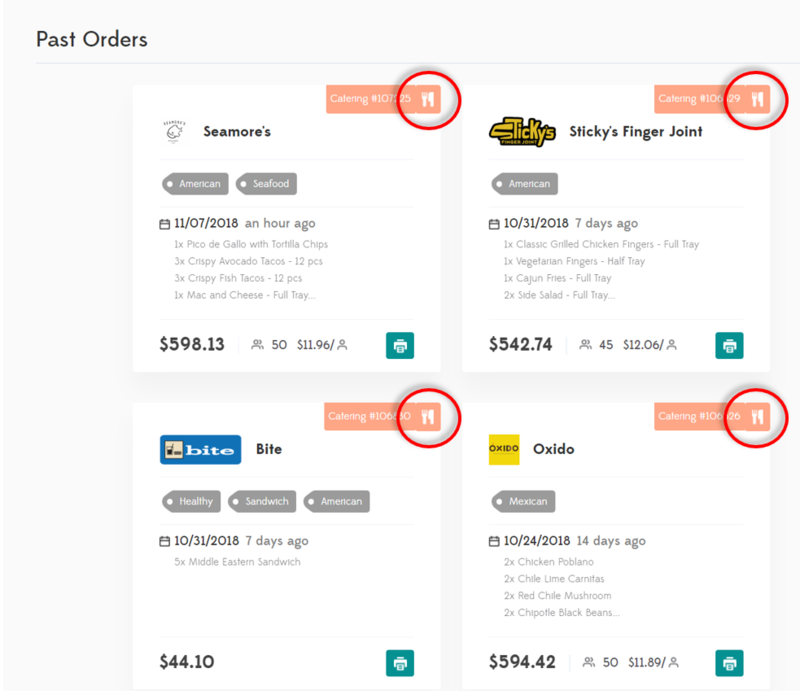 Thanks for reading this far, and we hope these features will make your lives easier when it comes to online ordering. Your customer experience is our utmost priority, and everything that we do at MobyDish is geared towards making that experience better. 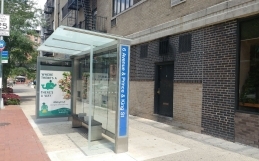 We love the challenge to innovate and and improve, so we welcome any and all feedback!